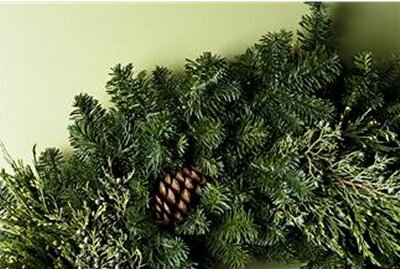 With a garden clipper or pruner, cut bows of pine, hemlock and red winter berries. Depending on where you live, you use anything that grows nearby and looks pretty to you. Cattails can be nice, for example. Arrange your collection to your liking with all the cut ends facing the same direction. Wrap the cut ends tightly with some wire, fashioning a hook. Hang the decoration on your front door. Very beautiful and a celebration of nature too. You can also use greenery in a similar way to make table centerpieces for your holiday events.